The present generation of European leaders will doubtless be remembered for many things, but somewhere high up there on the list will be the appauling sense of bad-timing they seem to have when making critical announcements. The confusion caused by certain ill-considered remarks from Angela Merkel about how private sectors bondholders would need to participate in future EU bailout processes is evidently one good example. Another, without doubt is going to be the decision by EU Commissioner Olli Rehn to appear before the world's press today (yes, today of all days, one day after the sensitive announcement of the Irish Bank Bail-out plan and the decision to create the European Financial Mechanism), and inform the assembled throngs that as far as the EU Commission could see Spain will not be sticking to its 6% of GDP fiscal deficit committment next year, simply because according to EU calculations the deficit is going to be 6.4% - unless, of course - there is another round of fiscal reduction measures. I think Spanish has a suitable word for this kind of persistent badtiming: "gafé". But the thing is, if Europe's leaders insist on continually showing the markets just how "gafé" they all are, then we are never going to find our way out of this hole we have all dug for ourselves. And so it was, that by 16:30 this afternoon the yield on 10 year Spanish bonds hit 5.5% (up from around 5.2 at Friday's close), and the spread over equivalent German Bunds hit a Euro-era record high of 273 basis points. 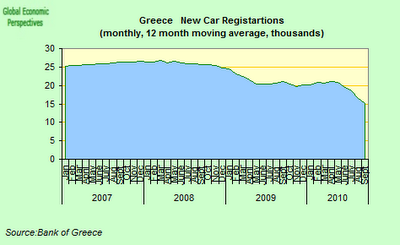 These sort of numbers were totally unimaginable at the start of 2010. The root of the problem comes from the fact that the EU Commission had identified today as the day when their economic forecasts for national economies were to be published, and so it was. As part of the forecast the commission fractionally lowered its 2011 growth outlook for Spain, to 0.7% from an earlier expectation of 0.8%. Hardly earth-shattering news, and not normally the sort of thing to send bond yields off into a "death spiral", but given the times we live in, markets are extraordinarily sensitive to any such revision. In fact, a downward revision of 0.1 percentage point is well within the bounds of any reasonable margin of error, and no one really has the foggiest idea of what Spanish growth will actually look like next year beyond the most approximate of approximate guesses. This is because the degree of uncertainty is unusually high in the external environment, and the impact of the very strong fiscal correction that is planned (from this years 9.2% deficit, to next years 6% one) is very hard to evaluate. Personally I think it will be very hard for Spain to get positive GDP growth at all next year given all we are seeing, but I certainly don't want to engage in a Dutch auction with the Spanish authorities on this point. 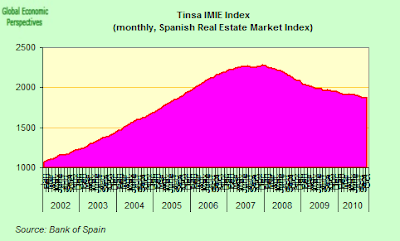 But in fact the potential difficulties for Spain to achieve the 6% target for 2011 were already reasonably well known. 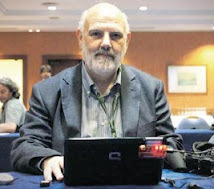 I had already written about it in this post, were I pointed out the difficulty Spain's regional and local governments were having this year in meeting targets, and how important it was going to be to stick by the letter of next years budget plan if the administration did not wish to face the wrath of the markets. The Bank of Spain governor reinforced this point by adding that in a highly decentralized Spain, where the central government directly controls less than a third of spending, and lacks sufficient means to supervise the fiscal policies of regional and local administrations, it was extremely difficult for the central government to get an exact result. His opinion was that these august bodies be required to publish budget data in a more timely fashion and be given an annual spending ceiling. 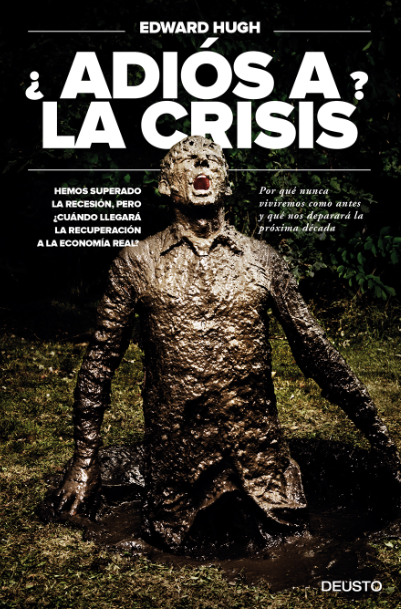 In fact, these days the Spanish government cannot afford to ignore what the Governor of its Central Bank says, and so the administration has gone some way to putting such controls in place, but whether they are sufficient to do the job or not still remains to be seen. Mafo's point was backed up later the same week by former Bank of Spain deputy governor and current IMF Official José Viñals, who stated "Spain should be willing to carry out additional fiscal adjustments to achieve a budget deficit of 6 percent of gross domestic product by 2011 because markets have “zero tolerance” for failure to meet stated targets." So these issues are already known, Spain may well need to formulate a plan "B" if the governments hand is forced, but it was a pity to unsettle the markets just one more time by raising them again precisely today. Not everything in the report was bad news for Spain, however, since the commission did improve its forecast for this year. The EU now expects the country's GDP to contract by 0.2% in 2010, compared with the 0.4% contraction it had projected in the spring forecast, giving a little more power to the elbow of a struggling Elena Salgado who has recently been belabouring the point that her forecasts are better than those of the EU and the IMF. But next year will be the "test of fire" on this front, since it is starting next year that all those rather optimistic expectations on domestic consumption start to lock-in. Having said that, the EU now predicts that annual average unemployment will rise again next year, and hit 20.2% (above Salgado's forcecast). In fact this may well be an underestimate, since the September figure was 20.8%, and at the present time unemployment is still rising, and not falling. Indeed Olli Rehn himself stressed that there were "significant but balanced risks to the baseline scenario." And in particular he pointed out that further drops in house prices could lead to a "deeper-than-expected adjustment in construction, dent household wealth and sap consumer confidence." And yet that is just what Spain seems to continue to be facing, a slow drop-by-drop downward trickle in house prices. So what can the Spanish government do to stop the rot? Basically at this point very little. The ammunition has nearly all been fired off, and most of it has been wasted. And yet one more time we all seem to be in agreement. When asked what Spain and Portugal should do to stop the so-called contagion, I was quoted by the Financial Times as saying: “Not do anything wrong..... The only thing you can advise these people to do at this stage is to be absolutely frank and stick absolutely to what they say.” “From this point on, the more you do fiscal austerity, the more you contract and the less you can pay". And as luck would have it Miguel Angel Fernandez Ordonez was back before the Spanish senate the following day (his timing, unlike that of Olli Rehn, seems to be impeccable), telling all those senators that “We have to convince people that we’re going to do exactly what we said we were going to do.” Seems logical, doesn't it, I mean whyever would they imagine you might not do what you say you are going to do? Whatever put that wicked thought in their heads? And Mafo was also on this occasion perfectly frank about the growth situation: "The outlook for a gradual recovery is surrounded by uncertainties," he told the senators. "In an environment where financing conditions will foreseeably remain restrictive and in which the public and the private sector have a pressing need to clean up their financial position, we can expect the pace of recovery in household consumption to slow versus the first half of the year." So, summing up. Spain is suffering from the serious restrictions imposed on trying to make a major economic correction while participating in a monetary union (Paul Krugman is once more making similar points in today's New York Times). In particular this means that not only does the country not have a currency to devalue, it does not have a central bank with capacity to print money and buy its bonds. It also has a very substantial exposure in terms of the external position (ie debt) that makes it dependent on international financial markets for funding in a way that means that the extremely low interest rates that are on offer at the ECB are not really (beyond some limited non standard liquidity measures) passed on to the countries banks, her citizens, her companies or her government. Spain has the benefits of neither expansionary fiscal or monetary tools in the midst of a huge output slump, where the underlying contractionary tendencies in the economy are still substantial. Given all of this, and given that Spain's leaders have at last shown some signs that they are aware of the seriousness of the situation that faces the country, I think it is being cruel beyond belief to haggle over whether the deficit next year will be 6% or 6.4%, let alone send Spanish bond values into a suicidal downward spiral that risks destroying what is still left of the countries banks over the issue. Spain needs to stick to its deficit reduction targets, but it also needs more help from those who are running the system by which it is trapped and which it is struggling hard to defend. Pile the pressure on and the country is only going to crack. What Spain needs is to get back to growth, and to put people back to work, then the deficit problems will sort themselves out almost on their own. And in this sense it is the authors of the latest EU forecast, and not those who run the Spanish administration who are the unrealistic ones. Spain is in a corner which it can't get out of alone. She needs help, and that help is going to have to come from the top. If Spain still had its own currency, like the United States — or like Britain, which shares some of the same characteristics — it could have let that currency fall, making its industry competitive again. But with Spain on the euro, that option isn’t available. Instead, Spain must achieve “internal devaluation”: it must cut wages and prices until its costs are back in line with its neighbors. Internal devaluation is coming, there is now no avoiding it. When I advanced the idea for Spain some three years ago it wasn't some sort of contribution to a collective brainstorming session, it wasn't just one option on offer together with a whole series of others. What I was saying was if we don't go down this path then would would inevitably end up where we are now. But as Krugman points out, seeing it through means the private sector debt problem will only deteriorate, which is why we need help, to share the burden. The other alternative, of seeing the Euro fall apart, is in the interests of no one. Not even the Germans, who would soon see the current record growth in their exports shifted into reverse gear as the new DeutscheMark was quoted at values (as is happening to the Japanese yen right now) which robbed the country of all semblance of competitiveness. Well, today we have a new government in Catalonia. So maybe its time to change. Maybe finally we could now start to address the problems of the Spanish economy head-on, and put the future of the country on a sound and sustainable footing. It's certainly worth a try, and, at least, as the English saying goes: where there's life, there's hope. 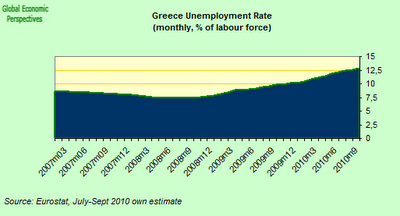 Greece Is Almost Certainly "On Track" - But Towards Which Destination Is It Headed? "There is a difficulty that is widely recognized that the amount [of debt] to be repaid is high in 2014 and 2015," Giorgios Papaconstantinou (the Greek Finance Minister). 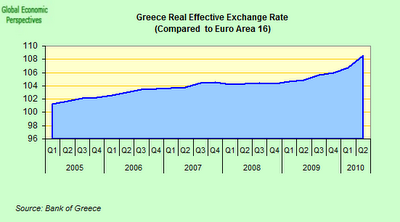 "We are confident that Greece will be able to return to the markets. But whether it will be able to return to the markets on a scale that allows Greece to pay off its European partners and the IMF, that is a question."... "We have a number of options. If paying off the €110 billion loan proves to be a question, we stand ready to exercise some of those options" - Poul Thomsen, head of the IMF team in the ECB-EU-IMF troika delegation. "In the rushed last-minute deal to forestall certain bankruptcy, everyone missed one very important fact. That the memorandum created an unrealistic and immense borrowing squeeze on the feckless Greek state for the next five years." Get On The Right Track Baby! According to the latest IMF-EU report Greece’s reform programme remians “broadly on track” even if the international lenders do acknowledge that this years fiscal deficit target will now not be met and that a fresh round of structural measures is needed if the country is to generate a sustained recovery. My difficulty here must be with my understanding of the English lexemes "remains" and "sustainable", since for something to remain on track it should have been running along it previously (rather than never having gotten on it), and for something - in this case a recovery - to be sustained, it first needs to get started, and with an economy looking set to contract by nearly 4% this year, and the IMF forecasting a further shrinkage of 2.6% next year, many Greeks could be forgiven for thinking that talk of recovery at this point is, at the very least, premature. A more useful question might be "what kind of medicine is this that we are being given", and "what are the realistic chances that it actually works". Unfortunately, in the weird and wonderful world of Macro Economics, witch doctors are not in short supply. As the representatives of the so-called `troika`mission (the IMF, the ECB, and the EU) told the assembled journalists in last Tuesday's press conference “The programme has reached a critical juncture." Critical certainly (as in, in danger of going critical - just look at the 1,000 basis point spread between Greek and German 10 year bond yields, or the 4% contraction in GDP we look set to see this year), but the question we might really like to ask ourselves is what are the chances of the patient surviving the operation in one piece? The statement came at the end of a 10-day mission visit to Athens to review the extent to which the country was complying with the terms of the country’s €110bn bail-out package and take a decision on whether or not to authorise the release of the third tranche of the agreed loan. In the event the decision was a foregone conclusion, with the rekindling of the European Sovereign Debt Crisis as a background, and the very survival of the common currency in the longer term in question, this was no time to tell the markets the tranche was not being forwarded. 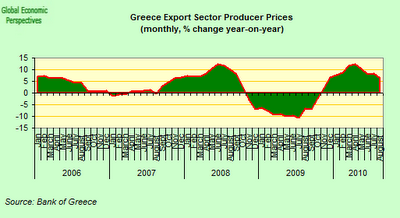 But still, the expression "on track" continues to fall somewhat short of expectation with the lingered issues like the recent upward revision of the Greek deficit numbers (up to 15.4% for 2009), the failure to increase revenue as much as anticipated, and the need for a further round of “belt tightening” measures in 2011 to try to attain the agreed objective of a 7.4% deficit as a backdrop. The upward revision in the deficit numbers only added to all the doubts many economists have about the long term payability of the Greek debt, which the IMF now expect to peak at around 145% of GDP in 2013, although again, many analysts put the number much higher. Independent analyst Philip Ammerman who is based in Greece, and whose expectations about the evolution of Greek debt have proved to be reasonably realistic, now expects debt to GDP to come in much higher than anticipated in 2010, due largely to 10 billion euros in debt from the train company OSE being added to the total and downward revisions in 2009 GDP from the Greek statistics office. The key to payability is of course a resumption of economic growth, which at the present time looks even more distant than ever. The IMF is arguing for another round of structural reforms – like opening up “closed-shop” professions, or simplifying administrative procedures and modernising collective wage bargaining, and while many of these are necessary, none of these are sufficiently “short sharp shock” like to restart the economy, and in general don’t target the main issue which is how to restore competitiveness to the country’s struggling export sector. Just One More Moment In Time! 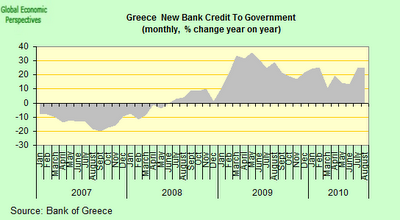 Doubts about how Greece was going to start financing its debts in the market after the expiry of the loan programme in 2013 had only been adding to market nervousness in recent days, since in addition to the fact that loan repayments to the EU and the IMF would need to start in 2014. 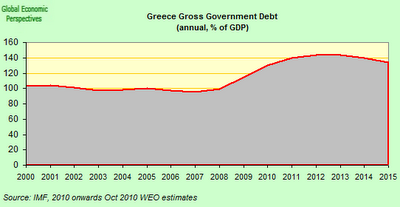 Most critical are the first two years, when the bulk of the debt to the EU and IMF falls due. 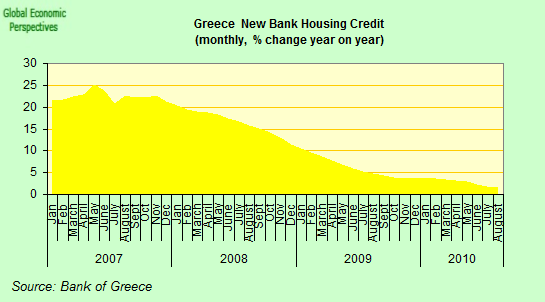 Under current repayment schedules, In fact, as things stand now, Greece's gross borrowing needs for 2014 and 2015 (when most of the EU-IMF debt falls due) will balloon to over 70 billion euros a year from around 55 billion euros a year in 2011-2013. This represents having to finance about 40% of GDP each year. Not an easy task. The difficulty presented by this looming repayment mountain lead the FT’s John Dizard to speculate that the Greek parliament might be tempted to go for the rapid passage of a law allowing for the application of “aggregate collective action” on bondholders – using the reasoning that, since the money being borrowed at the moment is basically being used to pay off existing bondholders (who are relatively easy to haircut) while the new lenders (the IMF and the EU) are (at least on paper) not. As John says, “Greece is exchanging outstanding debt that is legally and logistically easy to restructure on favourable terms with debt that is difficult or impossible to restructure. It’s as if they were borrowing from a Mafia loan shark to repay an advance from their grandmother”. What a (retroactive) aggregate collective action clause would mean is that if a specific fraction, say 80 per cent or 90 per cent, of existing Greek bondholders agree to a restructuring that lowers the net present value of Greek debt by, say, half, then the remaining “holdout” bondholders would be forced into accepting the same terms. It is the consideration that the Greek Parliament might be tempted to go down just such a road that possibly lies behind this weekends Reuters report that The EU and the IMF could extend the period in which Greece must repay its bailout loans by five years, to make it easier for it to service its debt. According hot the agency Poul Thomsen, the IMF official in charge of the Greek bailout, stated in an interview with the Greek newspaper Realnews "We have the possibility to extend the repayment period ... from about six years to around 11," This follows earlier reported statements from Mr Thomsen the the IMF “could provide part of the funding on a longer repayment period, or give a follow-up loan.” Indeed the announcement of the Irish Bailout details seems to suggest there has been a general change of position here, since the Irish loan is initially to be for seven and a half years (which certainly does suggest we are all trying hard to kick the can further and further down the road), while - in what you might think was a token nod in the direction of John Dizard's argument, aggregate collective action clauses are now to be written into all bond agreements after 2013. It will be interesting to see how the existing bondholders themselves respond to this proposal when the markets open tomorrow (Monday) morning. So now we know that in fact Greece is likely to be able to extend its dependence on the IMF all the way through to 2020, the only really major question facing us all is: just how small will the Greek economy have become by the time we reach that point. To start to answer that question, let’s take a look at some of the macro economic realities which lie behind the “impressive start” the Mr Thomsen tells us the Greek economy has made. The IMF-EU-ECB austerity measures have - predictably - generated a sharp contraction in Greek GDP, with falling industrial output, falling investment, falling incomes, falling retail sales, and rising inflation and unemployment. The big issue dividing Macro Economists at this point is whether countries forming part of a currency union which have a competitiveness problem are best served by their fiscal difficulties being addressed first. Arguably countries which do not have the luxury of implementing a swift and decisive devaluation to restore their competitiveness would be best served by receiving fiscal support from other part of the monetary unionion to soften the blow as they implement a comprehensive programme of internal devaluation to reduce their price and wage levels. That is to say the current approach has the issue back to front, and will undoubtedly lead the countries concerned into even more problems as slashing government spending at a time when no other sector is able to grow is only likely to create a vicious spiral which leads nowhere except towards eventual and inevitable default. To date Greek GDP has fallen some 6.8% from its highest point in Q1 2008, yet far from bottoming out, the contraction seems to be accelerating under the hammer blows of ever stronger fiscal adjustments, and the downard slump still has a long way to go. 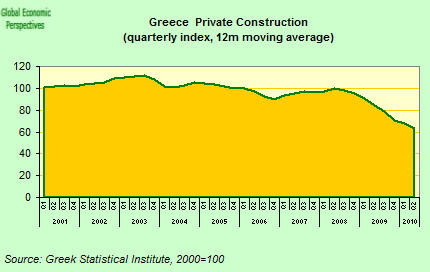 The Greek economy contracted by 1.1% quarter-on-quarter in the third quarter of 2010, making for the eighth consecutive quarter of contraction. 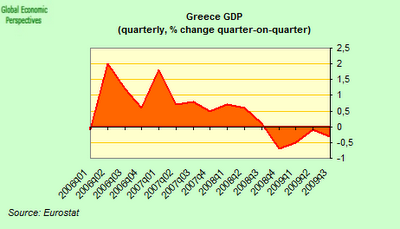 And evidently there are still have several more quarters of GDP contraction lying out there in front of us. 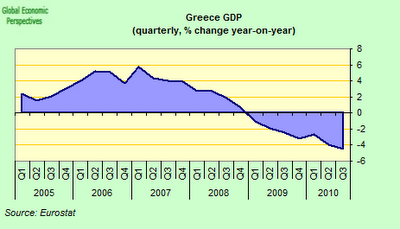 Year on year the Greek economy was down by 4.5% on the third quarter of 2009. This is the fastest rate of interannual contraction so far. Far from slowing the contraction seems to be accelerating at this point. 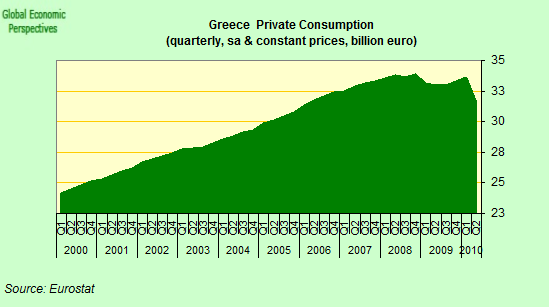 Looking at the chart below, it is clear that Greece enjoyed quite a consumption boom in the first years of the Euro's existence, a boom which is in some ways reminiscent of those other booms in Ireland and Spain, and a boom which came roundly to an end when the credit markets started to shut down. 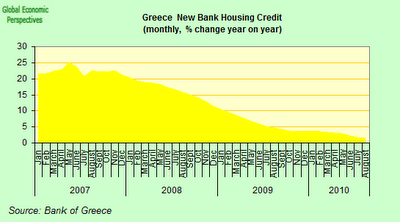 As in other countries, the government stepped in with borrowing to try to keep the boom going, with the major difference that deficitfinance went to levels well beyond those seen in other European countries in 2009, as did the efforts the Greek government went to to try to cover its tracks. One of the clearest indications that the party is now well and truly over is the way in which the level of new car registrations is slumping. 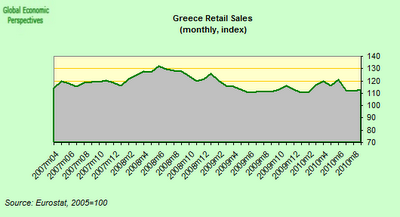 Retail sales have now fallen by something over 15%. The Greek consumption boom came to an end, just as it did in Spain and Ireland, when the credit crunch started to bite in 2008. Pre-crisis household borrowing was increasing at the rate of around 20%, the interannual rate of change has now fallen more or less to zero, and will stay there for some time to come. 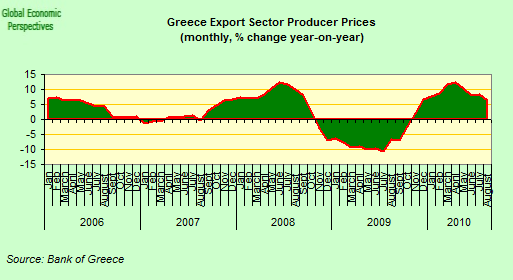 Since in a mature modern economy aggregate demand (whatever you do in the way of supply side reforms) can only grow in a sustained way as a result of either credit expansion or exports, export growth is going to have to give the Greek economy what little demand growth it can eventually get. 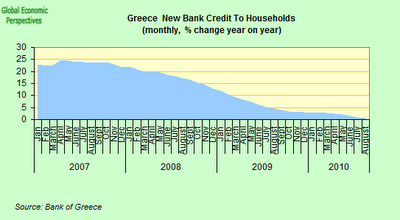 Along with the general stagnation in household credit, lending for mortgage borrowing has also ground to a sharp halt. And credit to companies has also become pretty tight if we look at the next chart. Asin many other heavily indebted countries (the US, the UK, Spain) the only sector which is still able to leverage itself is the public one, or at least which was still able to drive demand by leveraging itself, but now, with the IMF EU adjustment programme, increases in government borrowing are also going to suddenly come to an end, with the evident consequencethat the economy goes into reverse gear. I can't help feeling that people aren't using enough emotional intelligence here. Obviously people are outraged by the level of fiscal fraud that was going on in Greece. But outrage and demogogic press headlines seldom form the basis of sound policy. Arguably the competitiveness issue is more important at this point than the fiscal deficit one, since the position is asymmetric - solving the competitiveness issue will automatically open the door to solving the fiscal deficit one, while addressing the fiscal deficit does not necessarily resolve the competitiveness problem, and does not return the country to growth - only a strong supply side dose of ideology can lead you to (mistakenly) think that. 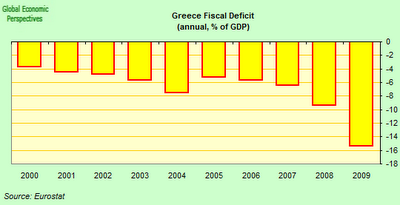 In fact, the fiscal adjustment programme contains two components, reducing spending, and increasing taxes. Of these the most damaging measure as far as growth and competitiveness goes is without doubt the decision to raise VAT by 5%. Not only (as we shall see) does this increase not raise the extra money anticipated (in an economy which is increasingly export dependent the tax base for a consumption tax weakens by-the-quarter in relative terms), it also sharply raises the domestic inflation rate, effectively ADDING to the competitiveness problem. I would say this obsession of the IMF with raising VAT in these economies which are effectively unable to devalue is just plain daft, frankly. And it doesn't impress me how many times respected micro economists describe raising VAT as the most benign of measures: all this does is convince me that they don't really have an adequate understanding of how economies work from a macro point of view, and especially not export dependent economies. As we can see in the chart below, the VAT rise not only adds to the consumer price index, it also affects producer prices, and even export sector producer prices, which are sharply up. I would say that policymakers have fallen into two "Econ 101 simpleton" type errors here. The first is to think that since part of the objective is to raise nominal GDP to reduce debt to GDP, and since GDP is falling, raising the price level might help (I would call this the "fools gold" discovery), and the second is to imagine that since exports don't attract VAT, the impact is relatively benign, without stopping to think the the VAT hike also acts on inputs, and especially in an economy which suffers from chronic price and wage rigidity issues like the Greek one. If a first year student had sent me these kind of arguments in a term essay, aside form awarding a "fail", I think would recommend to the person that they would perhaps be better off studying another topic, physics maybe, since the demonstrated aptitude for applied macro economics would be very low indeed. Could it be that bondholders who normally understand quite a lot more than many imagine about how economies work are also noticing this, hence their growing nervousness. it has even hadits virtual currency revalued against the EuroArea average since entering the IMF sponsored programme, which is the exact opposite of what we need to see. 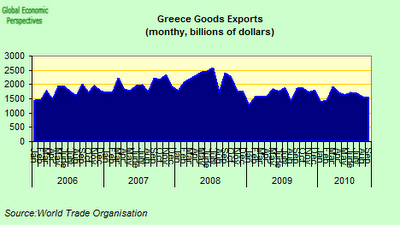 As a result we are seeing no evidence of a Germany-type resurgence in export activity. 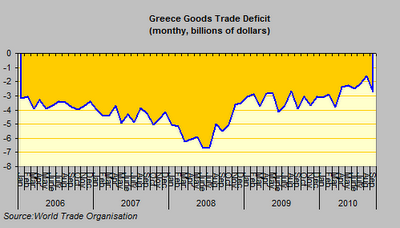 And in fact even though the trade deficit has reduced somewhat, it still remains a trade deficit. 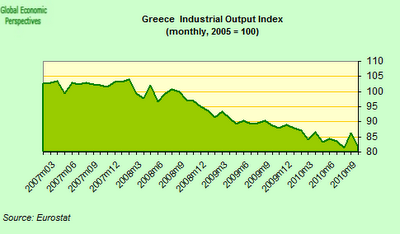 Given the fact that domestic demand is falling, while exports stagnate, Greece's industrial sector is still in a sharp and continuing contraction. 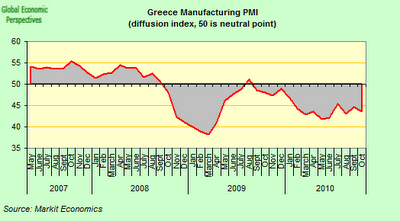 A contraction which continued and even accelerated slightly in October, according to the most recent PMI reading. 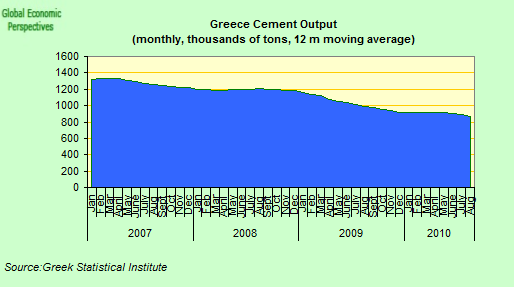 Construction activity is in "freefall", as can be seen from the drop in cement output. 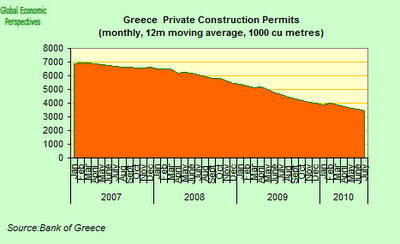 and the decline will surely continue, as new building permits continue to fall. And private construction activity continues to drop. The net result of the economic contraction and a credit crunch is, of course, that while other consumer prices rise, house prices are now falling, giving us just one more reason why Greeks are starting to feel a lot less wealthy than they used to feel. 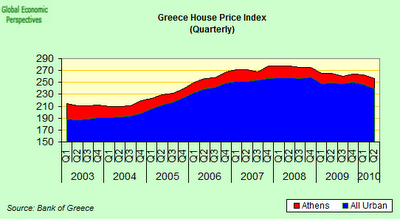 Evidently, to kick start the economy again the fall in land and property prices needs to be brought to a halt. 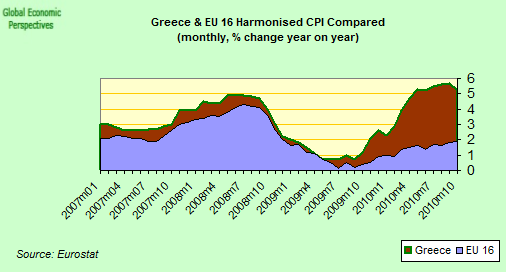 This is where the traditional devaluation strategy helped a lot, since you could stop the fall in nominal prices at a stroke, but the Greeks are helpless in this case, and it is rather alarming to find that there is no discussion of this key issue at the policy level, and just talk about how structural reforms will put everything right. The man and woman power is there to rebuild the economy, as ageing hasn't yet reached the point where the labour force will start to shrink. Indeed at this point it is still rising. But, of course, employment is now falling. And thus, logically, unemployment is rising, and is currently something over 12%. And with the rise in unemployment, there is a fall in incomes, and thus income tax revenue is falling, putting yet more pressure on the deficit. 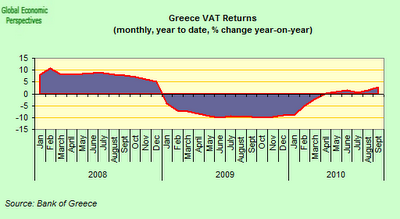 At the same time, and despite a 5% increase in VAT rates, returns on the tax are also not rising as hoped. A Contraction Which Feeds On Itself? The Greek fiscal deficit is now falling, but after the huge upward revision in the 2009 figure, getting it down towards this years 9.4% target is a more or less Herculean task, which will involve far more fiscal effort than was previously anticipated, and with the fiscal effort more economic contraction. In addition, the finance ministry recently reported that while Greece's central-government deficit narrowed by 30% in the first 10 months of this year, this still fell short of the targeted narrowing of 32% due to lower than anticipated revenue returns. 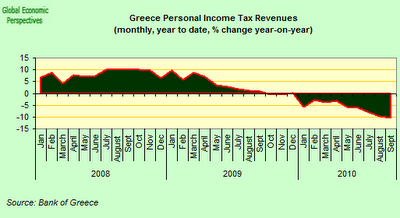 Finance ministry data show that the Greek central government took in 41.0 billion euros in revenue in the first 10 months of 2010, just 3.7% more than it did in the same period of 2009. The deficit-reduction plan hammered out with the EU and the IMF in May called for 13.7% growth in such revenues for 2010 as a whole. This implies that to meet the target, Greece must receive 14.1 euros billion in November and December, which is highly improbable given that to date this year the Greek government has only once had monthly revenue above €5 billion, and that was in January. On the spending side things have gone better, and targets are being met. Indeed over the summer the Greek government put forward a revised plan that compensates for the lower revenue with deeper spending cuts. But even meeting the lowered target of €52.7 billion would require a 30% jump over last year's revenue for the last two months of the year, and this is well nigh impossible. As a result of the revenue shortfalls and the revision in the 2009 deficit, Greece still looks to be well short of the 7.8% of GDP deficit originally aimed for. 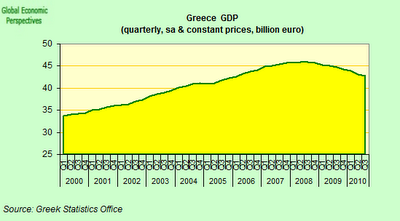 Current estimates are for a shortfall this year of something like 9.4% of GDP. In order to try to soothe market fears in this unsettled environment the Greek government last week unveiled a further austerity plan for 2011 involving an addition 5 billion euros in cuts, with the objective of cutting public deficit to 7.4% of GDP by the end of next year. Apart from the fiscal effort involved the new budget will almost certainly involve a stronger economic contraction than previously anticipated - and indeed the Greek government have already revised their forecast to 3% from the previous expectation of a 2.6% shrinkage. The problem is, that Greece is in danger of a counterproductive downward spiral here, since the revenue shortfall is at least partially the result of the existing budget austerity, which has simply helped to squeeze an already weak economy. The expected sharp contractions in GDP this year and next, will weighing heavily on revenue from income and sales taxes. Cuts to public-sector paychecks that went into affect this summer, for instance, have certainly helped contribute to a fall of about 10% in retail sales in August and September, and continuing unemployment rising above 12% will only add to the banking sectors bad debt problems. In my opinion the IMF are making a fundamental mistake in relying almost exclusively on structural reforms. "It has to come through structural reforms," Mr. Thomsen said, adding that he expected those reforms to be discussed at the next visit by the delegation early next year. "It cannot come through higher tax rates, that's not good for the economy, and it cannot come from more wage cuts because that is not fair." 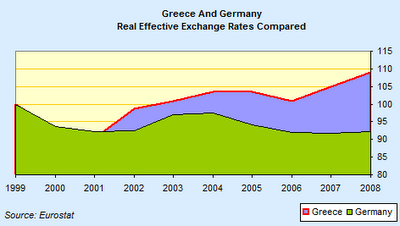 The are right that more taxes and less salaries without corresponding price reductions don't solve the problem, but Greece needs to do something radical (like a sharp internal devaluation) to restore competitiveness rapidly. Pushing the issues out to 2020 is no solution, and it is hard to imagine Greek civil society will accept the levels of unemployment and social dislocation that are being produced for such a lengthy period of time. Estimates of the future path of Greek debt vary a lot, and their is considerable uncertainty involved in any estimate. The IMF currently forecast that the debt will peak at just under 145% of GDP in 2013, but I think we can regard that as an estimate at the lower end of the range. 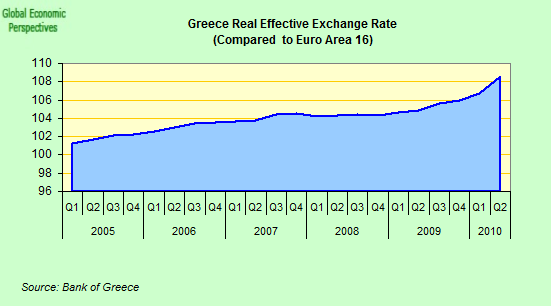 Despite the fact that George Papandreou's government has been widely praised for enforcing draconian austerity measures, the country still has the largest debt-to-GDP ratio in the EU, which involves a debt mountain of something like 330 billion euros - only 110 billion of which will be funded by the EU-IMF rescue programme. 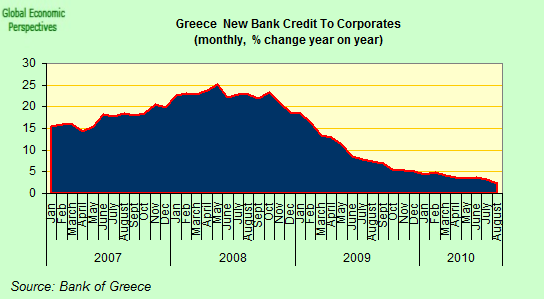 That is to say, private sector bondholders will still have something like (at least) 220 billion euros of exposure to Greek debt come 2013. Greece's whopping current account deficit has reduced to some extent since the 2008 15% of GDP high, but the level is still quite large. 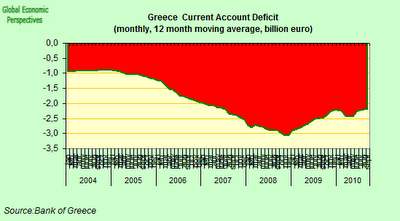 More importantly the IMF do not forsee Greece running a current account surplus at least before 2015. 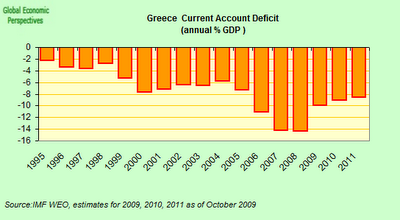 Indeed they imagine that Greece will still have a current account deficit of 4% of GDP come 2015. 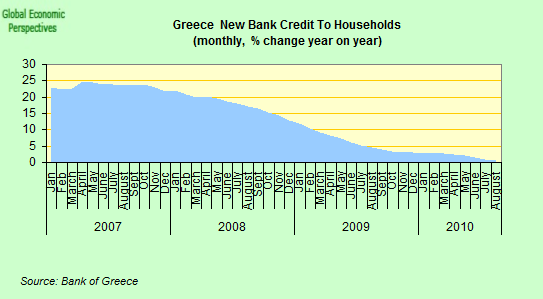 Which means that far from paying down their external debt, Greek indebtedness (absent restructuring) will continue to rise over the whole period. According to Greek central bank data, the country had a net external investment position of 199 billion euros in 2009, or put another way, net external debt was something like 110% of GDP. At the end of last week, risk premiums on 10-year Greek bonds over their German equivalents were still timidly nosing above 1,000 basis points, a level many consider to be the market signal that default is likely. And this despite the International Monetary Fund having announced the same day that the Greek reform programme is “broadly on track”. And then there is the return to the financial markets issue. Finance Minister George Papaconstantinou has repeatedly said the country would return to bond markets when the time was right sometime in 2011. 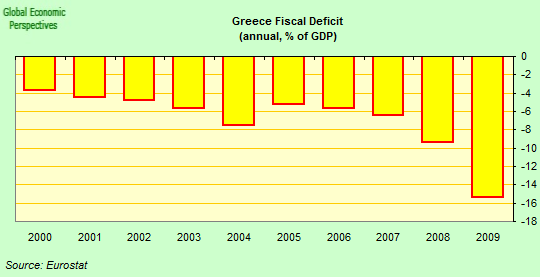 This looks increasingly like wishful thinking, especially since the 2009 deficit revision by Eurostat, while the less than anticipated revenue performance means that Greece has already missed its first fiscal consolidation target. Such a lapse may convince inspectors from the EU and the IMF, but it is unlikely to cut too much ice with ultra conservative fixed income market participants. And, as Nick Skrekas points out in the Wall Street Journal, the numbers simply don’t add up. Greece has to raise €84 billion to repay interest and principle over the next three years, even assuming the force of the economic contraction doesn't mean even more missed deficit targets . Add to that an additional €70 billion for each of 2014 and 2015 in repayment of EU-IMF loans, and the calculation equals an unavoidable default, which is what the markets are signalling with there 1,000 to the sky is the limit spread on Greek 10 year bonds over bunds. Even in the pre-crisis days, Greece couldn’t realistically raise more than about €50 billion a year from markets that trusted it. And market participants know the ‘troika’ is being unrealistic in its expectations. Lack of conviction in the bond markets that Greece can survive without a default is creating a vicious cycle that keeps prospective borrowing costs elevated and thus makes eventual repayment even more unlikely. And round and round and round and round we go. In this sense the troika’s earlier inflexibility over the repayment postponement issue has been entirely self-defeating. The delay in letting the markets know that extension was a possibility is rumored to have been in part due to the German government's worries about what the reaction inside Germany would be to the news. Evidently borrowers are going to be able to kick the can a lot harder and a lot further down the road than previously imagined. Indeed only today Ireland is seemingly to get money over a nine year term, which makes it hard to see how exactly the European Financial Stability Facility can be wound up in 2013 as previously planned - indeed the way things are shaping up it looks like 2013 could be the year when it really gets going. 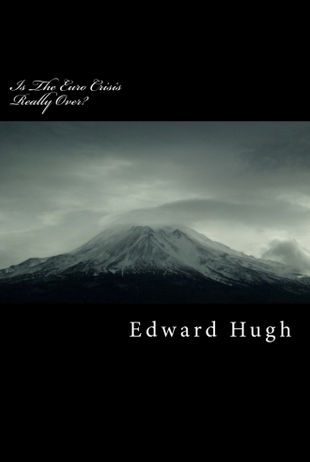 Which, as John Dizzard notes in the Financial Times, would seem to create a new potential moral hazard problem, which is that if the funds in the pot are going to be limited, and if potential costs going forward are likely to be high, then we could see a rush to get in (before the funds are all used) with few in any hurry at all to leave. Giving Spain the prospect of 350 billion euros (or thereabouts) over seven and a half years mights seem very tempting, but it is unlikely that those in Rome would be happy to pay rather than join the queue standing next to the soup pot. So, what this all boils down to is, that along with the EU and IMF we can be in no doubt: the reform programme evidently is on track. The only issue which seems to divide everyone - and especially those office-bound Fund employees from their more financially savvy market-participant peers - concerns the exact name of the station towards which the train in question is heading.